Any research is only as good as the data that drives it, so choosing the right technique of data collection can make all the difference. In this article, we will look at four different data collection techniques – Observation, Questionnaire, Interview and Focus Group Session – and evaluate their suitability under different circumstances. Seeing is believing, they say. Making direct observations of simplistic phenomena can be a very quick and effective way of collecting data with minimal intrusion. Establishing the right mechanism for making the observation is all you need. Non-responsive sample subjects are a non-issue when you’re simply making direct observation. If the observation is simple and doesn’t require interpretation (e.g. the number of cars driving through an intersection per hour), this model doesn’t require a very extensive and well-tailored training regime for the survey workforce. Infrastructure requirement and preparation time are minimal for simple observations. More complex observations that ask observers to interpret something (e.g. how many cars are driving dangerously) require more complex training and are prone to bias. Analysis may rely heavily on experts who must know what to observe and how to interpret the observations once the data collection is done. There is the possibility of missing out on the complete picture due to the lack of direct interaction with sample subjects. Making direct observations can be a good way of collecting simple information about mechanical, orderly tasks, like checking the number of manual interventions required in a day to keep an assembly line functioning smoothly. Did you know there are actually 8 types of observation for data collection? Learn about when and how to use each with “How and When to Collect Observational Data”. Questionnaires, as we consider them here, are stand-alone instruments of data collection that will be administered to the sample subjects either through mail, phone or online. They have long been one of the most popular data collection techniques. Questionnaires give the researchers an opportunity to carefully structure and formulate the data collection plan with precision. Respondents can take these questionnaires at a convenient time and think about the answers at their own pace. The reach is theoretically limitless. The questionnaire can reach every corner of the globe if the medium allows for it. Questionnaires without human intervention (as we have taken them here) can be quite passive and miss out on some of the finer nuances, leaving the responses open to interpretation. Interviews and Focus Group Sessions, as we shall see later, are instrumental in overcoming this shortfall of questionnaires. Response rates can be quite low. Questionnaires can be designed well by choosing the right question types to optimize response rates, but very little can be done to encourage the respondents without directly conversing with them. The survey can be carried out through directly-administered questionnaires when the sample subjects are relatively well-versed with the ideas being discussed and comfortable at making the right responses without assistance. A survey about newspaper reading habits, for example, would be perfect for this mode. Conducting interviews can help you overcome most of the shortfalls of the previous two data collection techniques that we have discussed here by allowing you to build a deeper understanding of the thinking behind the respondents’ answers. Interviews help the researchers uncover rich, deep insight and learn information that they may have missed otherwise. The presence of an interviewer can give the respondents additional comfort while answering the questionnaire and ensure correct interpretation of the questions. The physical presence of a persistent, well-trained interviewer can significantly improve the response rate. Reaching out to all respondents to conduct interviews is a massive, time-consuming exercise that leads to a major increase in the cost of conducting a survey. To ensure the effectiveness of the whole exercise, the interviewers must be well-trained in the necessary soft skills and the relevant subject matter. Interviews are the most suitable technique for surveys that touch upon complex issues like healthcare and family welfare. The presence of an interviewer to help respondents interpret and understand the questions can be critical to the success of the survey. Focus Group Sessions take the interactive benefits of an interview to the next level by bringing a carefully chosen group together for a moderated discussion on the subject of the survey. The presence of several relevant people together at the same time can encourage them to engage in a healthy discussion and help researchers uncover information that they may not have envisaged. It helps the researchers corroborate the facts instantly; any inaccurate response will most likely be countered by other members of the focus group. It gives the researchers a chance to view both sides of the coin and build a balanced perspective on the matter. Finding groups of people who are relevant to the survey and persuading them to come together for the session at the same time can be a difficult task. The presence of excessively loud members in the focus group can subdue the opinions of those who are less vocal. The members of a focus group can often fall prey to group-think if one of them turns out to be remarkably persuasive and influential. This will bury the diversity of opinion that may have otherwise emerged. The moderator of a Focus Group Session must be on guard to prevent this from happening. Focus Group Sessions with the lecturers of a university can be a good way of collecting information on ways in which our education system can be made more research-driven. Read more about the steps of conducting a successful focus group discussion. 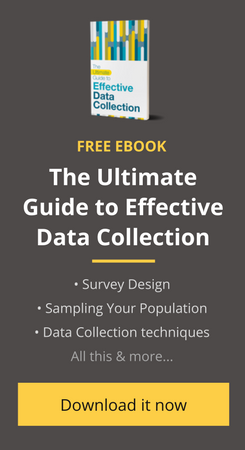 Keeping these factors in mind will go a long way toward helping you choose between the four data collection techniques. The recent evolution of technology has given researchers powerful tools and dramatically transformed the ways that researchers interface with their subjects. We have converted this article into a quick Slideshare presentation for you to read at your own convenience. Collect and analyze any kind of qualitative and quantitative data with Collect, our mobile data collection and analysis platform. Start your free trial now! Note: This article was originally published on 26 August 2015, then refreshed and updated on 16 August 2017. Hi how can one find the pdf version of this article?